Peruvian sandwiches. Fast-casual Moroccan. Malaysian-Chinese comfort food. Grandpa’s go-to dinner. The latest crop of NYC restaurants are pulling from internationally influenced flavors or dipping into the past with nostalgic classics. Here are the places you need to add to your dining agenda, stat. We’ve found your new favorite toast spot—and there isn’t an avocado in sight. This recently resurrected LES cafe by chef-owner Kyo Pang and partner Moonlynn Tsai serves baba-nyonya (Malaysian-Chinese immigrant cuisine). Breakfast is a glorious spread of thickly cut French toast topped with Milo chocolate malt powder, kaya (a caramel-like coconut spread) toast, Penang-style white coffee (specially roasted and brewed with condensed milk), chilled sesame noodles and more. Don’t miss the blue rainbow sticky rice and nasi lemak at lunchtime (coconut rice, fried anchovies, cucumber, peanuts and a hard-boiled egg). Take away a sweet or three, like the honeycomb cake, coconut crepe, mochi or Malaysian shaved ice. They had us at pasta. Simple yet swoon-worthy pastas and veggies make their debut in Williamsburg at Misi, the highly anticipated second Italian restaurant from James Beard Award–winning chef Missy Robbins (of Lilia fame). Dive into plates of chickpea pappardelle with rosemary, linguine with anchovy, whole roasted eggplant and garlicky runner beans (paired with a spritz, Bellini fizz or negroni sour). While you’re there, take a peek into the pasta-making room, where you can watch your noods being freshly rolled. There’s a new sandwich king in town—and it’s Peruvian. Llamita, the younger fast-casual West Village sibling to chef Erik Ramirez’s modern Peruvian spot Llama Inn, focuses on sanguiches (sandwiches), smoothies and other Peruvian specialities. Chomp into a rib-eye sandwich with charred onion, Gruyère and lomo saltado sauce, or duck sausage with choclo (Peruvian corn) and chimichurri. Sip on smoothies featuring native Peruvian superfood ingredients like lucuma, maca, camu camu and algarrobina. We also loved the juicy pollo a la brasa (Peruvian rotisserie chicken) and tamales. The space is colorful with washed pastels (read: Instagrammable), and the coffee bar features locally roasted Peruvian coffee, prepared foods and a retail area. Even non-vegans can get on board with the indulgent meat- and dairy-free menu at Sans in Carroll Gardens. The brain behind the plant-based menu and beverage program is chef Champ Jones (formerly of Eleven Madison Park and The NoMad—and not even exclusively vegan) and acclaimed sommelier Daniel Beedle (The NoMad, Betony, Juni). Explore dishes like lasagna with red sauce, béchamel and savory foam, black plum terrine with pickled plum, jam and brioche, or the cheeky “TV Dinner” (a take on meatloaf) of mushroom farce with peas, carrots and pomme puree. The cocktail program focuses on minimizing waste by repurposing ingredients throughout the menu and features house-made savory and sweet cold fermented shrubs. You don’t need an S.O. during sweater weather—Sofreh’s Persian home cooking is our new favorite way to get cozy. In an airy Prospect Heights space, chef-owner Nasim Alikhani turns out classic dishes flavored with warming spices, such as fesenjan (tender chicken stew with ground walnuts and pomegranate molasses served over rice), albaloo polo (a savory sour-cherry rice) and khoresht beh aloo (lamb and quince stew). A restaurant dedicated to couscous? If it’s from chef Einat Admony of Taim falafel fame, then you know it’s a must-visit. Kish-Kash makes hand-rolled Moroccan couscous as well as authentic North African Jewish cuisine like braised meats (all kosher! ), fish, challah and pickled veggies, and serves wines from Israel and North Africa. Try Admony’s couscous with lamb, almonds and dried fruits or delicious tbecha (short rib) with Swiss chard and white beans. The fast-casual space is adorned with intricately patterned blue and white tiles that make for an especially photo-worthy meal. Chill out in the laid-back desert oasis that is Dez, Canadian-Israeli chef Eden Grinshpan’s debut restaurant in Nolita. The menu features Grinshpan’s take on classic Middle Eastern cuisine: Think carrot meze with harissa, honey and labneh, Instagrammable pink beet hummus, sabich salad and falafel cauliflower pita to name a few. On the weekends, brunch over cardamom waffles, halvah toast and hummus bowls. End on a sweet note with the addictive tahini soft serve with cookie crumbles. This Japanese-American cocktail bar in the West Village is like the too-cool foreign-exchange student you wished you could be in high school. The cheeky, dive-bar-esque establishment serves highballs, cocktails, boilermakers and Japanese whiskey alongside izakaya and traditional American bar food. You’ll find deviled eggs with miso and salmon roe, fries with nori, a Japanese deli-style egg-salad sandwich and a crispy mortadella katsu sando with tonkatsu sauce and Dijon mustard on daiichi bread. This adorable neighborhood coffee bar in Carroll Gardens, housed in a former pharmacy that dates back to 1901, has been around for a while, but the spot has big ambitions: to be the greenest coffee shop in Brooklyn. That means it will no longer use or offer single-use plastic by January 1, 2019 (it has already ditched plastic straws). Co-owner (and Cherry Bombe editorial director) Kerry Diamond and culinary director Gabi Vigoreaux serve inventive baked goods like maple sea-salt biscuits with butter and blackberry jam and homemade zucchini-cheddar pop tarts. Just remember, BYOM (bring your own mug). 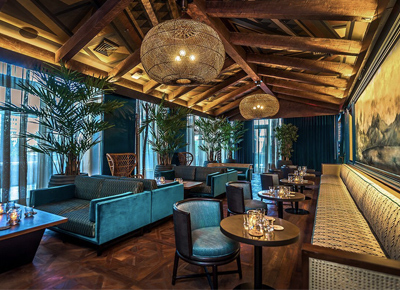 Cali-cool vibes have landed in NYC with the arrival of this wood-fired Mexican spot. The airy whitewashed space is punctuated by skylights and dripping with vines. Named after the Aztec goddess of the night, Oxomoco (pronounced with long O’s and a soft X, like the first syllable of ocean) has an exciting Mexi-Cali menu: masa-battered fried shrimp, beet “chorizo” and albacore tuna achiote alongside the usual taco suspects. Bonus: Brunch is served seven days a week, so treat yourself to midweek chorizo verde and chicharrón on a concha, horchata chia pudding and masa griddle cakes. Following firstborn and highly lauded Atoboy comes Atomix, the innovative Korean restaurant and bar in Gramercy by husband-and-wife team Junghyun and Ellia Park. The multi-course tasting menu at the 16-seat chef’s counter takes an almost educational approach, teaching diners about Korean food and culture in the sleek, minimalist space. The ten-course menu comes complete with banchan (traditional Korean side dishes) and highlights include the langoustine, golden eye snapper and Wagyu with fermented pear juice. Bernie’s in Greenpoint is making your grandparents’ food cool again (the place is actually named after the grandfathers of co-owner Zach Frankel and chef Ashley Berman). Along with co-owner Taylor McEwan, the team has created the ultimate nostalgic throwback restaurant that younger crowds have fallen in love with, thanks to modern takes on oldies like vinegar chicken, baked clams, wedge salads, crab cakes and martinis. Decor is as old-school as it gets: red leather banquettes, a long wooden bar and red-and-white-checkered tablecloths topped with butcher paper and crayons (you know, for the grandkids). Another darling from chef Einat Admony, Balaboosta is back from its brief hiatus in a new West Village location. The highly anticipated revamp in the former Bar Bolonat space includes both old favorites and new riffs on homespun Israeli and Middle Eastern classics, like lemon cardamom pasta with Swiss chard, pine nuts and dry goat yogurt; and lamb neck with preserved lemon, dates and sunchoke. The gypsy beer with a cult following is now being served in a brick-and-mortar brewery that’s unlike any other brewery you’ve ever seen before. Think a Silver Lake L.A. aesthetic in East Williamsburg: a bright white, open-air taproom illuminated by naked incandescent hanging lights and splashed with tropical plants and playful wallpaper. The ever-changing rotation of beers features many sours, like the popular Flow State (a golden sour aged in oak and orange bitters barrels). Pair your pick with Middle Eastern–inspired bites from Samesa, located inside the brewery. The menu features chicken shawarma, pumpernickel pita, beet hummus and pulled-lamb quesadillas. Coming in hot to the NYC restaurant scene is Adda, an Indian restaurant situated in Long Island City next to a 7-Eleven. It’s the kind of restaurant that doesn’t need to try too hard to be cool because it just is: casual, welcoming, affordably priced and delicious. (Adda actually means “a place where people hang out.”) Chef Chintan Pandya (of Rahi and formerly the Michelin-starred Junoon) delights with dishes in a minimalist, cozy space like Dilliwala butter chicken, tandoori cauliflower, dilli pakodi chaat (crispy lentil fritters) and lamb seekh kebab with green chili and mint.